Before there was Wisteria Lane, there was the French royal court at the Palais du Louvre in Paris. It was a place of forced marriages, lovers and infidelities, imprisonments and poisonings, sword fights and murders. And all that was just within the castle walls. A little bit of that past is hidden in Washington State University's archives, in a delicate book with a yellow leather cover. It is a firsthand account of life there with details of some of the greatest scandals and intrigues of French history. The 378-year-old vellum-paged book holds the memoirs of Marguerite de Valois, also known as Queen Margot. 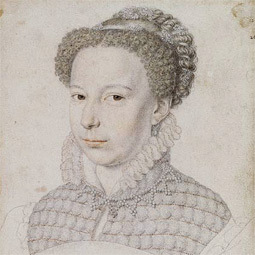 She was a daughter of Catherine de Medici and King Henri II of France, sister to two kings of France and the ex-wife of a third, and often a pawn in her family's political maneuverings. The book was printed in 1628 in Paris, 14 years after her death. Margot was lovely and well educated. According to the accounts of court visitors, she pursued her studies more vigilantly than her brothers and sisters, could speak several languages beautifully, and was a clever conversationalist. Women of the French nobility at that time were extraordinarily influential, says French history professor Steven Kale. They were married to rulers in nearby kingdoms to stabilize their families' political influence but were often at the crossroads of conflicting alliances. Her memoir focuses on 1565-1582, until her 29th year. She describes a country in turmoil, with Catholics and the Huguenots/French Protestants fighting for power and a family that was just as fractious. She relates how one brother first urged her to be their mother's confidante and then turned the queen against her by suggesting that Margot might marry and give away the secrets of the throne. According to her account, she came through the incident having learned how to navigate her family intrigues. History has it that her lover was Henri Duc De Guise, the founder of the Catholic League, a group of influential French aristocrats formed to stifle the growth and influence of the Protestants. But then her family forced her to marry Henri, king of the French province of Navarre, and head of the Protestant Huguenots in an attempt to make peace between the Catholic and Protestant factions. The plan failed. Days later, the St. Bartholomew's massacre was started in Paris by French soldiers and Catholic clergy, just as some of the country's most influential Protestants were in Paris for the wedding. "Allegedly the bodies clogged the Siene," says associate professor Sue Peabody, who teaches European history at WSU Vancouver. Margaret was caught in the middle, Catholic by birth and yet married to a Huguenot. The newlyweds were in the palace of the Louvre when the attacks began, and the young queen saw one man killed at her feet. For three years after the massacre, she and her husband were kept prisoners at the castle. Margot's account shows that she quickly learned to work between both sides to prevent further tragedy. Though her book ends before she turns 30, Margot lived on to age 62. Her marriage to Henri of Navarre was ultimately annulled. And, after Margot's brothers died, Navarre became King of France. How such a precious book came to be in the WSU archive collections is still a bit of a mystery. According to the accession documents dating to 1938, the book was purchased for 94 cents. It appears to be part of a collection of more than a hundred books purchased from a bookseller in England. Most are tomes from the 1600s and 1700s, and are French or Italian. Among the collection, interestingly, is a counterpoint to Margot's account, the memoir of Henri duc de Guise.